There’s nothing like the feeling of returning home after a long trip but for frequent flyers this can often mean a cold house, empty fridge and unmade bed. To solve this problem many of the word’s best hotels are offering residences for sale attached to their resorts and these properties – which are often as luxury as your superyacht - come complete with all the amenities and hospitality afforded to regular hotel guests while the latest luxury property developments also offer these services in a residents-only setting. Click through to see some of the best for sale now. 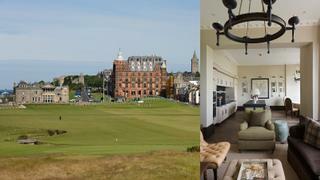 Apartment 7 at Hamilton Grand, St Andrews, Scotland The world famous St Andrews golf course has been drawing superyacht owners looking to tee off on the Scottish coast for decades and, in the process, has made this area the most desirable and exclusive place to buy property in the country. Hamilton Grand, a new series of residences converted from what was formerly the Grand Hotel and then the University of St Andrews' Hamilton Hall, offers some of the most luxurious with the star buy being one of the few remaining four bedroom apartments. Spanning 2,779 square feet on the fifth floor, apartment 7 offers incredible views over the golf course and the ocean beyond as well as three bathrooms, a cosy snug and an open-plan kitchen/living area all decked out in stylish but traditional decor. While not situated within a formal hotel, residents at Hamilton Grand are privy to a number of perks the most important, of course, being eligibility to apply for Links tickets offering immediate access to the six prestige golf courses of the Links Trust. Along with this, residents also have access to the Kohler Water Spa at the nearby Old Course Hotel, concierge, maid service, fitness centre, resident's lounge and a personal assistant to arrange services such as grocery stocking and private chefs. Apartment 7 at Hamilton Grand is for sale with Kholer for £6.1 million. There’s nothing like the feeling of returning home after a long trip but for frequent flyers this can often mean a cold house, empty fridge and unmade bed. To solve this problem many of the word’s best hotels are offering residences for sale attached to their resorts and these properties – which are often as luxury as your superyacht - come complete with all the amenities and hospitality afforded to regular hotel guests while the latest luxury property developments also offer these services in a residents-only setting. Click through to see some of the best for sale now. The world famous St Andrews golf course has been drawing superyacht owners looking to tee off on the Scottish coast for decades and, in the process, has made this area the most desirable and exclusive place to buy property in the country. Hamilton Grand, a new series of residences converted from what was formerly the Grand Hotel and then the University of St Andrews' Hamilton Hall, offers some of the most luxurious with the star buy being one of the few remaining four bedroom apartments. Spanning 2,779 square feet on the fifth floor, apartment 7 offers incredible views over the golf course and the ocean beyond as well as three bathrooms, a cosy snug and an open-plan kitchen/living area all decked out in stylish but traditional decor. While not situated within a formal hotel, residents at Hamilton Grand are privy to a number of perks the most important, of course, being eligibility to apply for Links tickets offering immediate access to the six prestige golf courses of the Links Trust. Along with this, residents also have access to the Kohler Water Spa at the nearby Old Course Hotel, concierge, maid service, fitness centre, resident's lounge and a personal assistant to arrange services such as grocery stocking and private chefs. Apartment 7 at Hamilton Grand is for sale with Kholer for £6.1 million. St Kitts' newest prime superyachting resort, Christophe Harbour, has just released the remaining six of its eight Upper Pavilion Hill residential sites offering potential owners the chance to create their dream new-build home in the heart of a buzzing Caribbean community. The smallest plot is just over one acre, making the sites some of the largest on offer in the islands, and owners can opt to use Christophe Harbour's local expert builders and architects or their own design teams, with a custom-built home achievable in just 18 months. As well as eligibility for the Citizenship by Investment Programme, which gives property owners on St Kitts and Nevis and their families lifelong dual citizenship, residents at Christophe Harbour can also benefit from a range of luxury amenities including a concierge service that can create bespoke itineraries to make the most of the island as well as a private Pavilion members' beach club and restaurant. The new Customs House is also set to open this winter offering a gym and captain's lounge while the amenities of Christophe Harbour's superyacht marina, including the five-star Park Hyatt Hotel, SALT Plage beach bar, watersports and sailing, are also on your doorstep. Plans are also underway for a Tom Fazio-designed golf course, boutique hotel, and medical and wellness centre to open in the coming seasons. The Upper Pavilion Hill sites are listed for $1.25-1.85 million with Christophe Harbour. St Kitts' newest prime superyachting resort, Christophe Harbour, has just released the remaining six of its eight Upper Pavilion Hill residential sites offering potential owners the chance to create their dream new-build home in the heart of a buzzing Caribbean community. The smallest plot is just over one acre, making the sites some of the largest on offer in the islands, and owners can opt to use Christophe Harbour's local expert builders and architects or their own design teams, with a custom-built home achievable in just 18 months. As well as eligibility for the Citizenship by Investment Programme, which gives property owners on St Kitts and Nevis and their families lifelong dual citizenship, residents at Christophe Harbour can also benefit from a range of luxury amenities including a concierge service that can create bespoke itineraries to make the most of the island as well as a private Pavilion members' beach club and restaurant. The new Customs House is also set to open this winter offering a gym and captain's lounge while the amenities of Christophe Harbour's superyacht marina, including the five-star Park Hyatt Hotel, SALT Plage beach bar, watersports and sailing, are also on your doorstep. Plans are also underway for a Tom Fazio-designed golf course, boutique hotel, and medical and wellness centre to open in the coming seasons. The Upper Pavilion Hill sites are listed for $1.25-1.85 million with Christophe Harbour. Ever dreamed of owning a home that combines costal living with some of Europe's best golf courses? Designed by the Barcelona-based Lagula Arquitectes, this modern six-bedroom villa is situated in Quinta do Lago, a five-star residential community on the Ria Formosa nature reserve in southern Algarve. Sold fully furnished with interiors by Dutch firm Pure Allure, the property boasts large open plan living spaces with plenty of natural light, a gym, spa, cinema, wine cellar as well as large courtyards providing private terraces and an outdoor infinity pool. However, for fan's of outdoor living it is the Quinta do Lago resort which will prove the biggest draw. Located close to Faro on the Atlantic coast, the exclusive estates offers a host of five star hotel-style amenities, including three award-winning golf courses, as well as a golf academy and performance centre, 11 casual and fine dining restaurants and bars, a nightclub, tennis courts, padel courts and football pitches making it perfect for families looking for luxury and entertainment close to home. 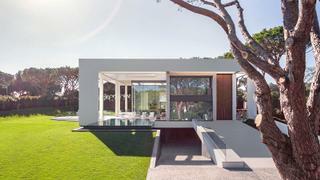 Lagula Villa is listed for sale with Quinta do Lago for €5.95 million. Ever dreamed of owning a home that combines costal living with some of Europe's best golf courses? Designed by the Barcelona-based Lagula Arquitectes, this modern six-bedroom villa is situated in Quinta do Lago, a five-star residential community on the Ria Formosa nature reserve in southern Algarve. Sold fully furnished with interiors by Dutch firm Pure Allure, the property boasts large open plan living spaces with plenty of natural light, a gym, spa, cinema, wine cellar as well as large courtyards providing private terraces and an outdoor infinity pool. However, for fan's of outdoor living it is the Quinta do Lago resort which will prove the biggest draw. Located close to Faro on the Atlantic coast, the exclusive estates offers a host of five star hotel-style amenities, including three award-winning golf courses, as well as a golf academy and performance centre, 11 casual and fine dining restaurants and bars, a nightclub, tennis courts, padel courts and football pitches making it perfect for families looking for luxury and entertainment close to home. Lagula Villa is listed for sale with Quinta do Lago for €5.95 million. If you already have permanent bases in Europe and America and are looking to put down roots further east 98 Wireless, the latest luxury residential project from Thai property developer Sansiri, could be the perfect option. Early investments in the 25-storey Beaux Arts-inspired building have been swift with all three palatial penthouses already snapped up. There are, however, some fabulous apartments still to be had and this three-bedroom 21st floor property is among the best. Set across 366 square metres on one floor, the residence boasts a huge 3.5 metre head height with floor-to ceiling windows throughout and is served by its own private lift. The large kitchen features fittings by Gaggenau, SieMatic, Franke and Statuario while the main bathroom and master en-suite are finished in Italian marble with Kallista, LeFroy Brooks and Kaldewei fittings. Elsewhere the first three floors of the building are dedicated to residents-only amenities including a 31 metre swimming pool, Jacuzzi, steam room, Technogym-designed fitness studio, underground parking with valet, Quintessentially concierge, meeting rooms, business lounge, tea room, spa, manicure room, children's playroom, terrace and driver's lounge while housekeeping, chauffeur, maintenance, grocery shopping and delivery services are also available. The 21st floor apartment at 98 Wireless is listed for sale for £6 million with Sansiri. If you already have permanent bases in Europe and America and are looking to put down roots further east 98 Wireless, the latest luxury residential project from Thai property developer Sansiri, could be the perfect option. Early investments in the 25-storey Beaux Arts-inspired building have been swift with all three palatial penthouses already snapped up. There are, however, some fabulous apartments still to be had and this three-bedroom 21st floor property is among the best. Set across 366 square metres on one floor, the residence boasts a huge 3.5 metre head height with floor-to ceiling windows throughout and is served by its own private lift. The large kitchen features fittings by Gaggenau, SieMatic, Franke and Statuario while the main bathroom and master en-suite are finished in Italian marble with Kallista, LeFroy Brooks and Kaldewei fittings. Elsewhere the first three floors of the building are dedicated to residents-only amenities including a 31 metre swimming pool, Jacuzzi, steam room, Technogym-designed fitness studio, underground parking with valet, Quintessentially concierge, meeting rooms, business lounge, tea room, spa, manicure room, children's playroom, terrace and driver's lounge while housekeeping, chauffeur, maintenance, grocery shopping and delivery services are also available. The 21st floor apartment at 98 Wireless is listed for sale for £6 million with Sansiri. Pearl Island, a Ritz Carlton Reserve resort in the Las Perlas archipelago of Panama, offers 120 real estate opportunities which benefit from the amenities and services of the nearby hotel. Of these, the most luxurious are the 11 four-bedroom residences found adjacent to the resort's beach club which boast unparalleled ocean views. As well as access to the resort's beaches, swimming pool, main lodge, spa, kid's club, dive centre, tennis courts, 48-berth marina and retail facilities, owners will also benefit from special privileges including private plane/boat transfers and restaurant and theatre reservations in nearby Panama City, butler, on call doctor, party planning, 'room' service, babysitting service and pet care. Residences at Pearl Island are available with price on application through Pearl Island. Pearl Island, a Ritz Carlton Reserve resort in the Las Perlas archipelago of Panama, offers 120 real estate opportunities which benefit from the amenities and services of the nearby hotel. Of these, the most luxurious are the 11 four-bedroom residences found adjacent to the resort's beach club which boast unparalleled ocean views. As well as access to the resort's beaches, swimming pool, main lodge, spa, kid's club, dive centre, tennis courts, 48-berth marina and retail facilities, owners will also benefit from special privileges including private plane/boat transfers and restaurant and theatre reservations in nearby Panama City, butler, on call doctor, party planning, 'room' service, babysitting service and pet care. Residences at Pearl Island are available with price on application through Pearl Island. Perched above the Time Warner Center and offering unbeatable views over Central Park and Manhattan, the Residences at the Mandarin Oriental in New York are ideal for dedicated urbanites. Each of the 64 residences, which are available with up to five bedrooms, offers access to the hotel’s The Aviary NYC cocktail lounge, a number of restaurants with options for 24-hour in-residence dining, the spa and yoga room, pool, 24-hour concierge, valet, housekeeping and privileged options to hire the hotel’s event spaces and ballroom. A dedicated residences team is also on hand for pre-arrival and ‘away from home’ maintenance and the hotel offers an exclusive Residences Elite programme. 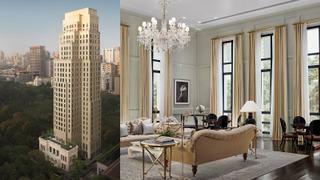 Five-bedroom residence 75C/75E at the Mandarin Oriental New York is currently listed for sale with Sotheby’s International Realty for $23,495,000. Perched above the Time Warner Center and offering unbeatable views over Central Park and Manhattan, the Residences at the Mandarin Oriental in New York are ideal for dedicated urbanites. Each of the 64 residences, which are available with up to five bedrooms, offers access to the hotel’s The Aviary NYC cocktail lounge, a number of restaurants with options for 24-hour in-residence dining, the spa and yoga room, pool, 24-hour concierge, valet, housekeeping and privileged options to hire the hotel’s event spaces and ballroom. A dedicated residences team is also on hand for pre-arrival and ‘away from home’ maintenance and the hotel offers an exclusive Residences Elite programme. Five-bedroom residence 75C/75E at the Mandarin Oriental New York is currently listed for sale with Sotheby’s International Realty for $23,495,000. Designed by award-winning architect Edward Tuttle, each of the stunning villas at Aman Hotel’s Amanzoe resort in the Peloponnese, Greece, offers the perfect home-away-from-home escape. 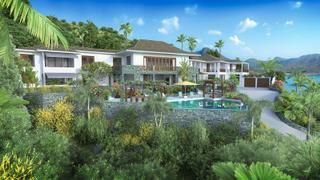 Situated around the main hotel building, each of the two to five bedroom villas boasts ocean views and private pools. Owners also gain privileged access to all the hotel’s facilities, including the private beach, beach club, Aman spa, numerous restaurants and Wally One and Pershing 62 yachts. As well as a dedicated villa team with a chef, concierge, babysitting service, maintenance and security, all Aman villa owners can take advantage of the group’s rental management scheme when not in residence. 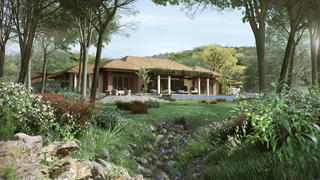 The Aman Villas at Amanzoe are available to buy from £3 million through Aman. Designed by award-winning architect Edward Tuttle, each of the stunning villas at Aman Hotel’s Amanzoe resort in the Peloponnese, Greece, offers the perfect home-away-from-home escape. Situated around the main hotel building, each of the two to five bedroom villas boasts ocean views and private pools. Owners also gain privileged access to all the hotel’s facilities, including the private beach, beach club, Aman spa, numerous restaurants and Wally One and Pershing 62 yachts. As well as a dedicated villa team with a chef, concierge, babysitting service, maintenance and security, all Aman villa owners can take advantage of the group’s rental management scheme when not in residence. 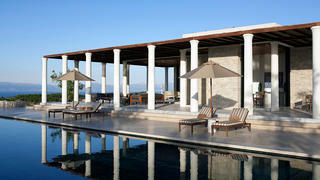 The Aman Villas at Amanzoe are available to buy from £3 million through Aman.